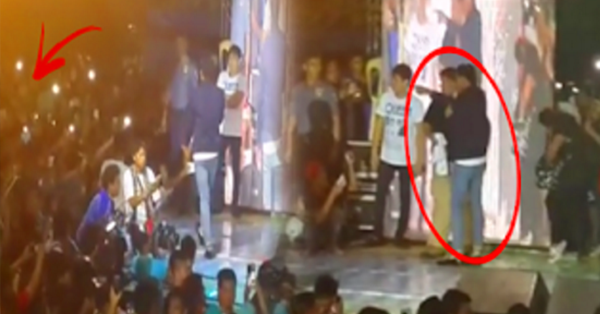 SHOCKING: The Truth Behind Daniel Padilla Being Bullied By Fans in a Live Performance! Being at a live performance is very difficult. You don't have any chances of repeating your failed act and you need to think and respond appropriately to certain unpredictable circumstances. Your professionalism will be tested in those situations and as a performer, you need to be careful. Teen King, Daniel Padilla is having his scene again on social media because of a video being viral and talked about by netizens. Based on a Facebook post of user Kenneth Talosig Ringor IV, Daniel Padilla was set to be on a live stage performance in the Ilagan City Sports Complex. While he is busy entertaining the fans, someone from the audience made a scene that destructed Padilla. A complete version of the performance was made available by the said Facebook user. At this version, Daniel still managed to finish his set in spite of the commotion. "Sa mga hindi po nakapanood ng guesting ni daniel ito po. 😃😊 Simula hanggang wakas. Sorry po medyo bleird (blurred). Magulo kasi mga kasama ko kaya bleird (blurred). 😂✌ Enjoy poh! 😃😄 Full video.👍💕 Sana makita kita ulit . Huhuhu 😭😭 Bwisit nman kasi yun eh. Epal 👊🔫 Na badtrip tuloy si Dj 😭😠😢"